The other day Noah and I were out to lunch at our favorite Chelsea café. I had never had a conversation with the owner, but I knew who he was as I see him nearly every day. On this day, he stopped at our table and said to me, “I know you. And, how could I forget this boy? He’s so polite. Always saying ‘please and thank-you.’ You must be very proud.” Noah smiled shyly. I said thank you and the manager went about his day. A couple of days later, we went to the Shake Shack in the park instead of the café for lunch. Noah politely ordered his hamburger and shake, sure to say please and thank you as always. The woman at the counter said to me with a smile, “That’s so nice to hear.” I was beaming from ear to ear as we walked away. Life moves fast. I watched a group of three-year-olds children playing in the park today and thought to myself, “Where did the time go?” I have worked full-time ever since my kids were babies so weekends were always hectic. When it was time for my boys to go to school, that meant even less time together. I worked, they went to school. After-school hours consisted of carpools and constant driving back and forth to dance, play rehearsals, activities, friends’ houses, etc. My kids grew up in the blink of an eye. I missed the little things – they came and went and I wasn’t around to witness them. Until now. the best we’ve had in recent memory. 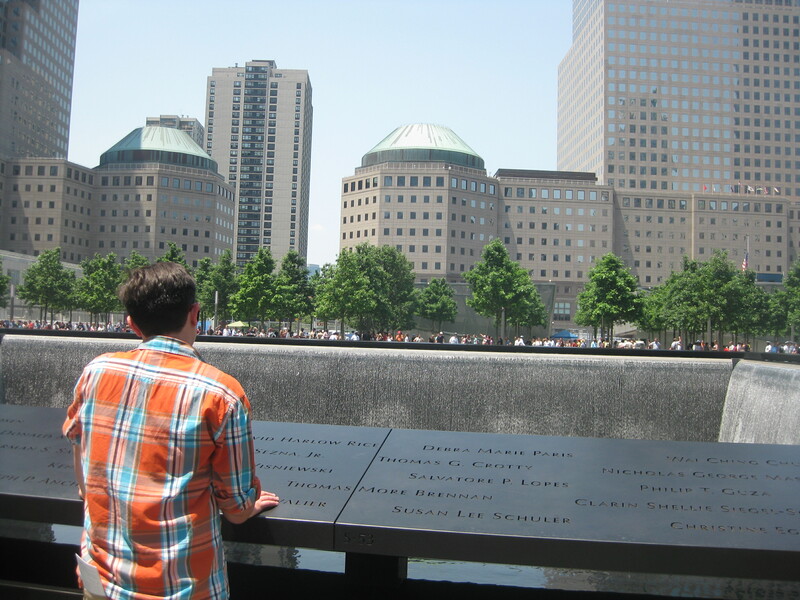 We went to Ground Zero and I saw him go from a silly teenager to a reflective young man. The teenager re-emerged when we got to Mid-Town Comics and Ethan picked out a collectible comic book that he had his eyes on. That day meant the world to me. I guess I needed to leave behind the day-to-day responsibilities of my “normal” life in order to appreciate what was there all along: two very special boys. Most people never get this chance. For what it’s worth, this past month in New York has been priceless. I feel as if I am getting to know my own children in a completely new light: not as my kids but as the truly incredible human beings they are. I am so grateful that I am able to witness the little things. I couldn’t be more proud. It wonderful to hear these precious moments you’re experiencing. And you paint such a wonderful picture with your writing, I can really see these/your moments in my mind so clearly. You are right, Robin. I worked part-time while my kids were growing up, and all my best memories are of times at the beach late in the afternoon when they were finding sea creatures in the shallows, or walking through the woods (and getting lost), and just being with them every single day as they grew up … I was very very lucky to have been able to choreograph their school plays, so I saw both Jarrod and Gelsey in situations where they were surrounded by their peers, and like you with Noah, I marveled at their maturity and talent and intelligence … we’re very lucky, but I content it’s a luck that you make as a parent–by being invested whole-heartedly in your children and giving them the very best of yourself .. miss you and Noah! Incredible incite to those precious moments we often let pass by us unnoticed. You are so lucky to have a chance to slow life down and notice them, especially since once they reach a certain age, they no longer want us (mothers) sharing in their lives. Enjoy every moment. I love your blog. I am a friend of Marilyn and am so very excited for Noah and have my tickets to see him perform. You seem so grounded. I myself have a grandson in little league and thats hard enough, rips my heart out when he makes a mistake, I cant imagine how you must feel. I look forwardcto your musings and am so happy for you. Stunning….your words and descriptions truly take me back in time and to a very emotional place- what a talent you have! It is so special to be experiencing this meaningful journey along with Noah, and as you say, we all have the opportunities to slow down and appreciate moments every day with our children and others in our lives- thank you again for the moving reminder! Keep them coming! What a great Mom you are to give Noah the kind of love and support that he truly needs to be successfull in his passion in life at such a tender age……..Cheers to you…..and thank you for taking us all on your journey with you!!!!!! Love reading your blog and this entry shows what a great example you have set for the boys. The one on one time is really important and sometimes hard to arrange. What a great opportunity for you both.